comment Visit Disneyland Park one day and Disney's California Adventure the next! Tickets are open-dated and can be used at any time during the calendar year purchased. Use of Disney Standard FASTPASS® system. Disneyland California Park 1 Park Per Day Tickets are the best way to see everything that Disneyland California has to offer. Your 2 Day Disney California Park 1 Park Per Day Ticket gives you entrance to both Disneyland California theme parks - Disney's California Adventure Park and Disneyland Park . The 2 Day Disney California Park 1 Park Per Day Ticket expires after 13 days from first use which means your two days at Disneyland California do not have to be taken over consecutive days. The original Walt Disney dream land and still an irresistible magnet for Californians and visitors alike. The Disneyland Resort Anaheim offers more than 60 classic attractions, unforgettable shows and special entertainment included in your Disney Ticket so experience the timeless magic and fantasy of Disneyland® Park, the world's first theme park. Famous Disney faces and world-class shows combine with eight themed lands to explore filled with exclusive Disneyland Park attractions. Command your very own Star Cruiser with Buzz Lightyear’s interactive Astro Blaster. Buckle up for the 're-launched' Space Mountain - the Disneyland classic is back! 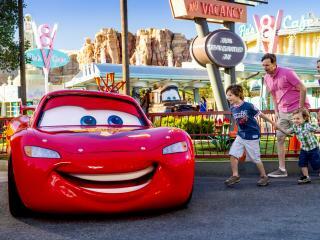 See family-friendly attractions like Main Street, U.S.A to Mickey's Toontown. Thunder through mine shafts, bat caves and caverns on the Big Thunder Mountain. Conquer the perilous peaks of Matterhorn Mountain on a high-speed thrill ride that will throttle you through icy chutes, around looming precipices and into the lair of the legendary abominable snowman on Matterhorn Bobsleds! Plunge five-storys from the Laughin' Place to the Briar Patch on Splash Mountain. Team up with Indy and journey into the sacred chambers of the Temple of the Forbidden Eye on the Indiana Jones™ Adventure. Four themed lands celebrate the world of California, from the fun of a beachfront boardwalk, to the magic of Hollywood, and the adventures of the great outdoors—all in one incredible place and all included in the price of your Disney Tickets. It’s Disney's California Adventure™ Park, and it’s located right next to Disneyland® Park. On Radiator Springs Racers kick the fun into overdrive and visit memorable locations from the Disney·Pixar movie Cars as you rocket through the desert landscape in a thrilling auto racing competition. This massive attraction is one the biggest rides ever at the Disneyland Resort! Twist, turn and loop upside down through Mickey Mouse's silhouette on California Screamin’! Tackle the thrilling raft adventure Grizzly River Run, one of Disney’s tallest, longest, fastest rapids ride yet! Dangle your toes just above the Golden Gate Bridge and Yosemite as you experience the ultimate sensation of free flight. Your Soarin'™ journey takes you from one end of the Golden State to the other in an awe-inspiring scenic tour. Grab some shell and take part in a righteous interactive chat with Crush, the totally awesome sea turtle from the Disney·Pixar film, "Finding Nemo." in Turtle Talk with Crush. Climb aboard a Monstropolis City Cab and embark on a wild ride through the streets of Monstropolis on Monsters, Inc. Mike & Sulley to the Rescue! Follow the escapades of Mike and Sulley as they race to return Boo to her bedroom before the trucks, helicopters and the Child Detection Agency find her first! At the end of the day enjoy the electrifying experience of Disney’s Electric Parade. Spend less time in line and more time having fun! Disney’s Standard FASTPASS® Service is free to guests and lets you make the most of your Disney Ticket by saving your place in line while you enjoy the rest of the park. Simply go to any Standard FASTPASS® attraction and use your Disneyland® admission ticket to obtain a Standard FASTPASS® ticket with a one-hour window of time printed on it. Return any time during that window and enjoy the attraction with only a minimal wait. Please Note: Once booked and confirmed Disneyland California Tickets are non-refundable and non-changeable. You will be sent a gate-ready Disneyland California 1 Park Per Day e-Ticket not a voucher, ensuring minimum fuss when you arrive at Disneyland Resort California. There is nothing to redeem and you simply go straight through the gate on arrival. Your Disneyland California Park 1 Park Per Day Ticket is valid for 2 days within a 13 day period - you do not need to visit the park over consecutive days. Tickets expire after 13 days even if you have not used all your days. There are no refunds for any unused days. Parks, attractions or entertainment may change operating hours, close due to refurbishing, capacity, weather, or special events, and may otherwise change or be discontinued without notice and without liability. Please note - if you are travelling within the next 72 hours please call us to expedite delivery of you e-ticket. Once booked and confirmed Disneyland California Tickets are non-refundable and non-changeable. 100% cancellation fees apply.